Weeknight dinners for us are always relatively quick and easy. Our little guy usually goes to bed right around our dinner time, so I things tend to get a little crazy in the kitchen if I don’t have things planned out or if the hubby isn’t home to help out. We stick to lots of one-pot meals or a protein with a side of carbs and veggies. Weekends however, are completely different. We spend lots of time in the kitchen and love to cook elaborate meals… or at least try new things. This meal falls somewhere in between a weeknight and a weekend meal. It takes a few minutes to prep, but then you let it sit on the stovetop and do its thing. A few hours later you’ve got a pot full of crazy good citrus carnitas. They’re seriously amazing! A few months ago I was able to attend Kelsey Nixon’s cookbook signing here in Utah. I was so excited to finally get a copy of her new book, Kitchen Confidence and pick through it for dinner ideas… let me tell you, she’s got a ton of good ones! Since then we’ve made several of her recipes and they’ve all turned out great. Her book has quickly become one of our favorites. Anyway, Stephen loves slow cooked meat and is always looking for a good pork recipe, so we gave this one a try. We’re so glad we did! Although we added a few things to spice it up a little more, it was full of amazing flavor, super tender and had great crispy bits too. Each bite was better than the last. We didn’t think that was possible. Stephen and I savored ever last morsel. He begged me to make it again… like the same week. We’ve made it a few times since and can’t seem to get enough. I like to make these homemade tortillas to serve the pork on, they make all the difference. And then there’s the pickled peppers and onions. 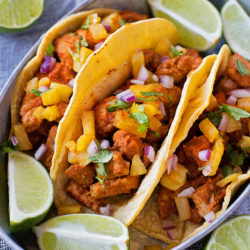 You’ve gotta try them! I mean look how beautiful they are! 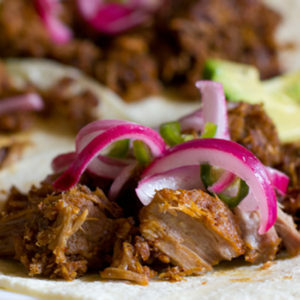 They add lots of zing to these carnitas. We also sprinkle a bit of cilantro, queso fresco and lime juice on top. Perfection. Serve these babies alongside some cilantro rice, zesty black beans and chips ‘n guac, and you’ve got yourself one incredible meal. 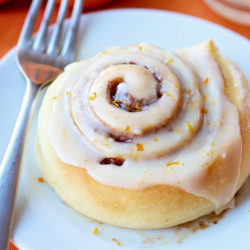 Wether you’re making these for yourself, your family or for a crowd, they’re sure to be a hit! 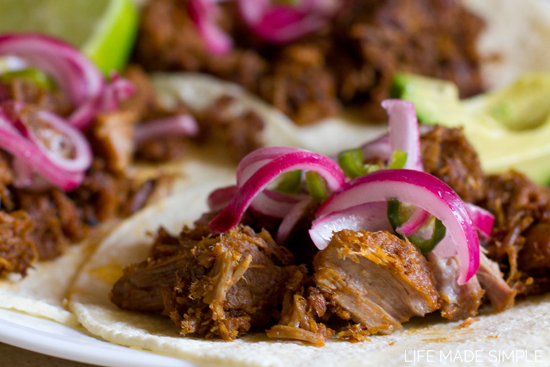 You’ve gotta give these stovetop citrus carnitas with pickled jalapeño and red onion, they’re delicious! 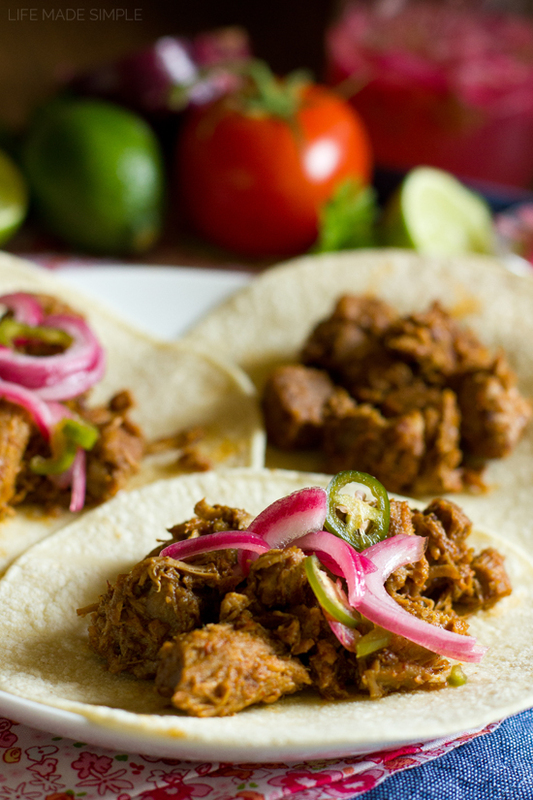 Tender flavorful stovetop citrus carnitas with pickled jalapeño and red onion. This dish is easily one of our favorite dinners of all time! Pickled Jalapeño and Red Onion: In a small saucepan set over medium-high heat, combine the lime juice, vinegar, sugar, salt, and jalapeño. Bring the mixture to a simmer, stirring until the sugar dissolves, about 2-3 minutes. Add the onion to a bowl or container (that has a lid) and pour the warm vinegar mixture over top. Let cool for 15 minutes then place in the refrigerator and chill for at least 30 minutes. For the carnitas: Trim any excess fat off of the pork shoulder and cut it into 2" pieces. Place the meat into a large dutch oven with a lid. Add the lime juice, orange juice, garlic, serrano pepper, chili powder, coriander, cumin, and salt. Add water to cover the pork (level to the top of the meat). Bring the mixture to a boil, then cover and reduce to medium-low, cook for 30 minutes. Remove the lid and continue cooking on medium (or a simmer) for 2 hours. At the very end, the liquid should have reduced substantially. Turn the heat up to medium-high and cook until all of the liquid has been absorbed. 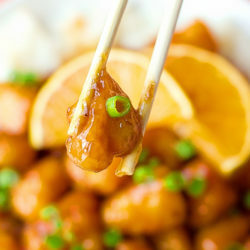 Carefully stir the pork until it becomes brown and crispy on the edges, but be careful not to burn it! Remove and serve immediately. 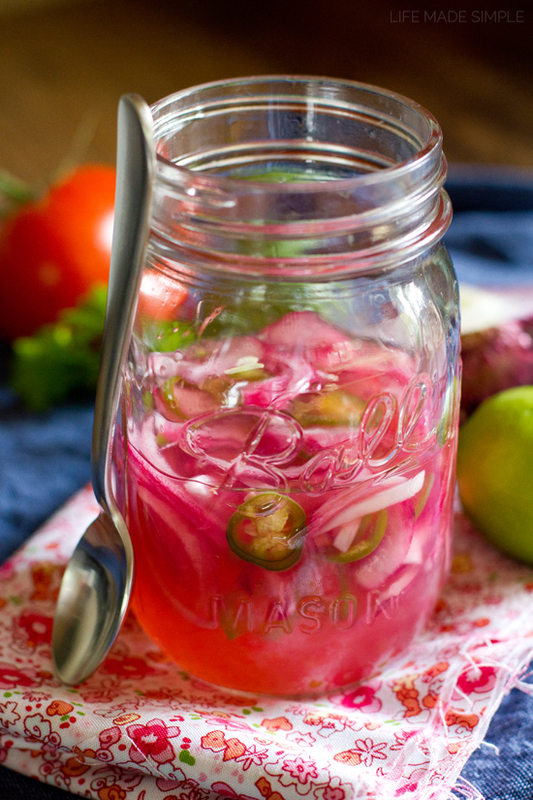 -Pickled peppers and onions can be made up to 3 days in advance.